We hear you—literally. When a cool, new restaurant opens, the buzz is deafening. Then things quiet a bit until the next spot roars onto O.C.’s dining landscape. The past year was particularly noisy with openings, and these are the most notable of a deliciously varied bunch. But brand-spanking-new is just the beginning—we’ve jazzed up the list with well-seasoned influencers that cast long shadows we can’t ignore. Make your reservations, and bon appétit. 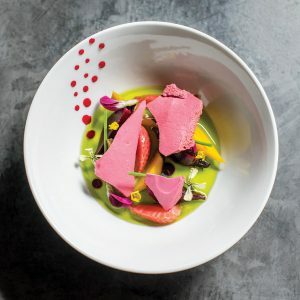 Executive Chef Zachary Geerson’s intricate cuisine isn’t copycat food, but it is inspired by the progressive likes of Michelin-level kitchens such as Chicago’s Alinea, Copenhagen’s Noma, and Vespertine in Los Angeles. Joining Geerson’s journey means diving into a $75 prix fixe dinner with a choice of dishes in each of four courses. The menu is just a list of key ingredients—you’ll need your knowledgeable server for a true description of all the dishes on offer. You might start with a Lilliputian “micro-burger” of smoked salmon belly, watercress, gooseberry ketchup, and pickled shallot on a sesame seed brioche meringue bun. Every dish is plated so creatively and so precisely that it flirts with obsession. Most important, every bite delivers. 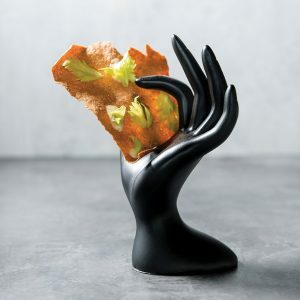 A tent of taupe “crackers” of mushroom-infused meringue hides hickory-smoked salmon roe, countered with preserved lemon jam that’s sharp, funky, and faintly fruity. Because the menu reflects Geerson’s 16 micro-seasons, it’s always updating. Last May’s relatively straightforward Spaghetti, Herbs, Spring Vegetables starred a swirl of house-made micro-fettuccine flattered by rainbow carrots, summer squash, and just-sprouted herbs. Savor midsummer’s raspberry and rhubarb crumble graced with brie ice cream, and you’ll relive it for months. Cocktails and mocktails are madly inventive yet well executed. A bar menu of noshy dishes makes Journeyman’s more accessible but no less enchanting. Despite the freeway-adjacent site at Hotel Fullerton, the sleek 52-seat room is an unexpected haven of calm and delight. You really should exit your typical circuit for a visit. Dine here with an open mind and heart, and the payoff is a memorable, immersive experience at an attractive price. 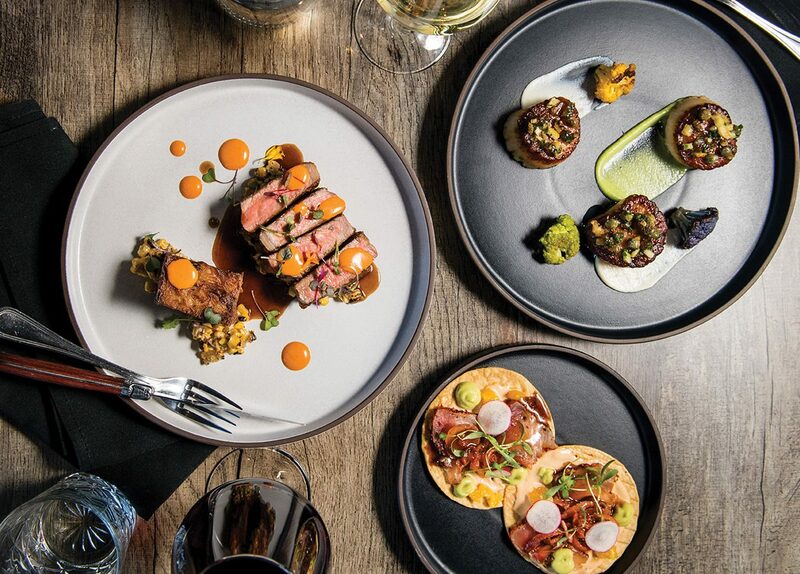 The hushed reverence of TACO MARÍA in Costa Mesa during chef-owner Carlos Salgado’s prix fixe-only tasting dinners allows tight focus on his interpretations of Mexican food so modern and ingenious that they compare to no other Mexican kitchen in Orange County. The late and much-missed Jonathan Gold of The Los Angeles Times deemed Taco María 2018’s Restaurant of the Year, an honor that now feels allegoric. This downtown Santa Ana hang has magical powers: It turns “No” into reasons to return. As in no Instagram vibe. No high prices. No frills. No drama. It makes Fleenor’s a versatile choice for unfussy, welcoming warmth and cooking by executive chef Linh Nguyen. His approachable menus and skilled kitchen target both foodies and feeders. Serving lunch, dinner, weekend brunch, and a happy hour thick with deals, this watering hole is game to please. Get some sweet-salty joy from shrimp fritters with shredded sweet potato. Ahi tuna poke on crispy rice is the happy snack you need with one of the terrific Old-Fashioneds or clever cocktails of the day. Ready for a not-boring vegan salad? There’s a mighty Shroom Burger of porcini- rubbed wagyu, Muenster cheese, and demi-glace clamped with a challah bun. Shockingly tasty pizza margherita is the real deal on a crust you can’t beat in this enclave. A petite New York steak, bone-in and dry-aged, is scary cheap for $26, but it’s expertly grilled and dressed with a classic au poivre sauce. This crew is low-key but in sync for a convivial vibe. Servers are obliging, and even the bar squad can be more engaging than required. It’s easy to fall in love with this grump-free zone. TUPELO JUNCTION CAFÉ is the preferred haunt for Balboa Peninsula locals who like to stroll or cycle their way to a folksy place with appealing down-home fare such as fried green tomatoes at lunch, red beans and rice anytime, rich scrambles for brunch, and, of course, dreamy fryer-fresh beignets. Laguna Beach loves its warm, cozy, and vintage restaurants, and Harley snuggles right in to the scene. 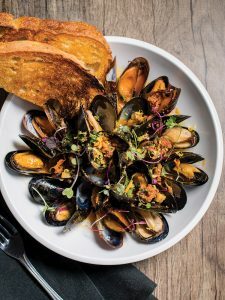 When Ryan Adams handed over his beloved 370 Common to Greg Daniels, formerly of Haven Gastropub in Orange, Daniels pulled off a spiffy reboot, opening Harley Laguna Beach in November. Refreshed to a comfy sheen, the two-story tavern is unfussy and welcoming, with vintage family photos on the wall, some featuring Daniels’ Grandpa Harley. As ever, Daniels coaxes savoriness from goods he buys from small producers such as GoneStraw Farms in Riverside. Their eggs with bright orange yolks become soft, jammy egg halves under clipped herbs, cracked pepper, and Terrace Hill Olive Oil (from near Paso Robles) in this version of deviled eggs. A wood grill powers up so many flavors—think wild mushrooms, local spiny lobster, duck breast, or grass-fed steaks. 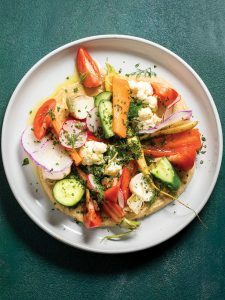 Produce gets careful attention, too: pickled and fermented veggies with hummus; roasted cauliflower under Moroccan spice yogurt; and don’t get me started on the coal-buried potato with raclette cheese. For dessert, how ’bout pecan pie and ice cream made with honey from Orange Park Acres’ own Backyard Bees? IRENIA’S Ryan Garlitos bumps up our Filo-gastro scene in Santa Ana with this tribute to his grandma Irenia, who inspires his kitchen-table cuisine tweaked with local ingredients and modern technique. Service is tops, and the drinks are delicious. Don’t skip the ube pie, nearly impossible to find outside a bake sale. 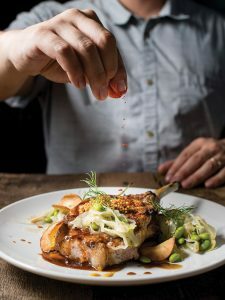 Open since September, Terrace leverages the success of chef Ross Pangilinan’s Mix Mix Kitchen Bar in downtown Santa Ana, where he built a fan base for refined Euro-Filo fare with high character backed by a cozy craft bar. From a sweet site on the top floor of South Coast Plaza overlooking the stylish Bridge of Gardens pedestrian skywalk, Terrace serves a constant flow of lunchers, brunchers, famished shoppers, and dinner patrons. The Mix Mix regard for value lives on here, with a three-course prix fixe lunch and two tiers of prix fixe menus at dinner. Most impressive, all menus are seasonal and include choices that pivot from delicate to earthy to sumptuous. Think options that swing from roasted vegetable soup to hamachi crudo to handmade agnolotti to fall-apart braised pork cheek adobo atop garlic fried rice. Weekend brunch looks beyond the ubiquitous chilaquiles, offering fare that might include a pork ribeye brioche Benedict with Yukon and yam hash. Terrace’s recent tweaks include cocktails using fortified sake and a Sunday supper from 3 p.m. to closing. There would be no Terrace without downtown Santa Ana’s MIX MIX KITCHEN BAR. 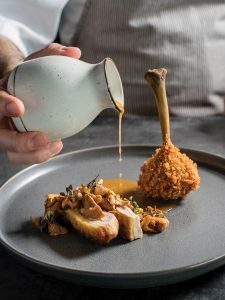 It’s where Pangilinan bravely took his class act to a shaggy urban corner and wowed us with refined technique, inventive Filo-tinged menus, and a charming craft bar to boot. Three years later, Mix Mix remains a crucial player in the heart of O.C. PROVENANCE grows what many other restaurants buy, which is to say greens, herbs, tomatoes, squash, peppers, and more. Even the cocktails share the garden’s bounty. 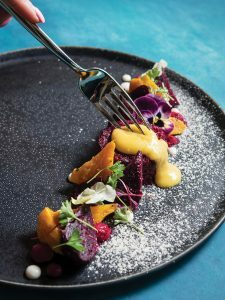 Sure, the farmhouse-inspired digs are welcoming, but dining beside the organic garden in Newport Beach that yields what you’re eating absolutely elevates the significance of fresh and seasonal. Descanso is this year’s standout for mostly familiar Mexican eats, but the novel twist here is the elevation of the taquero to center stage. 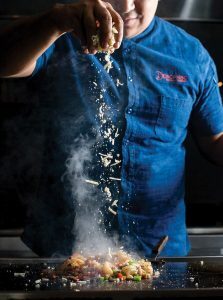 Inspired by the sensational street foods of Mexico City, owner Rob Arellano seats us right at the plancha grill to watch the taquero cook in full artisan action. Icy cocktails appear on request via a server who delivers non-taco delights from an inventive menu overseen by chef Sergio Ortega, a Michoacan native and veteran of upscale kitchens that include Raya and AnQi. Order your choice of six tacos from the taquero, but don’t miss the gooey choriqueso verde starter or the terrific aguachile of yellowtail, as both have some firepower. If tame is your game, the Mexi Poke is commendable, and the Mexican Slaw makes a perky, all-purpose side. Seating choices abound, as you can have a plancha room just for your party, sit at the bar, or at traditional tables. It’s a mighty large Costa Mesa venue with thoughtful design touches, but I have eyes only for the taquero before me, and I’ll return for the sirloin alambres in those most excellent tortillas. Happy hour is particularly tempting here, if you can scoot in midweek, from 3 to 6 p.m.
PUESTO celebrates the vibrant Mexico City scene with two Irvine locations oozing head-turning style and a ceaseless devotion to out-of-the-box tacos, drinks, desserts, and a menu that’s always going somewhere new. Potato taquitos with black garlic chile oil, anyone? Or give the chicken tomatillo bowl a try; it’s brimful of braised chicken, lime rice, black beans, avocado, and habanero macadamia nuts. Gabbi and Ed Patrick of Gabbi’s Kitchen launched Chaak in August to show off the county’s most sophisticated take on the regional fare of Mexico’s wondrous Yucatan Peninsula, where flavors include wood smoke, charred chile rubs, achiote marinades, sweet limes, and intense Seville oranges. 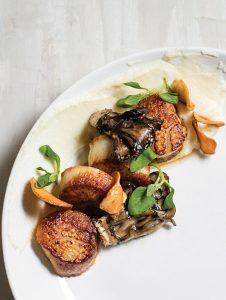 A dazzling retool of an Old Town Tustin office is now a sun-splashed space that begs you to relax while chef de cuisine Vincent Espin-oza and crew perform their scratch-kitchen alchemy. Designed by O.C. native architect Leason Pomeroy, sliding Roman shades under a retractable glass roof are the striking focal points that first impress. Definitely start with the Mayan sikil pec, a shareable dip of roasted, ground pumpkin seeds. Much of this food requires days to prepare. Like the braised turkey with a near-black paste (recado) of peppers and chiles. Or the tamal colado, a silky tamale of strained masa steamed in a banana leaf and topped with wild mushroom ragu and nubs of spicy pork sausage made in-house. For lunch, don’t miss the mighty torta layered with savory cochinita pibil, the Yucatecan predecessor of pulled pork, avocado aioli, and xnipek, a bracing relish fueled by habanero. Sopa de lima, a steamy poultry-bone broth boosted by shredded smoked chicken and bright green beans, tastes more complex than it sounds. 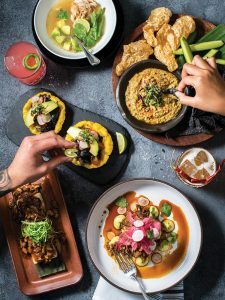 SOL COCINA near Newport Beach’s bay is where chef-founder Deb Schneider shares her decades-long adoration of Baja and its lively, almost-improvisational fresh combinations that make for memorable ceviches, fish tacos, and short ribs barbacoa. Superior tequilas are much loved here; the selection is striking and includes a house single-barrel Casa Noble reposado. 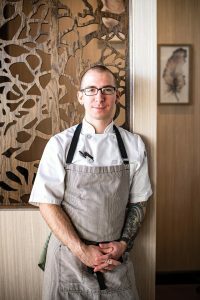 Laguna Beach peeps saw a dream come true when Craig Strong departed Montage to launch his personal restaurant in October in a revered village location. We expected a gorgeous patio and seaside-chic dining room, along with meticulous creations that show off dazzling local goods. What we didn’t foresee was the delight of accessing casual meals not aimed at resort-goers. We can have elevated pizza or a burger with a local beer at the bar, a lazy Sunday brunch of spiced pancakes, or a patio luncheon with friends enriched by Strong’s talent and a crew that takes hospitality seriously. Do not miss the oxtail kale risotto imbued with Parmigiano-Reggiano at dinner. Its soulful flavors of creamy rice tinted green with kale are a perfect match for shreds of luscious braised beef. If available, spring for the upgrade of white truffle shavings. For a first course that satisfies under heavy marine layer or relentless sunshine, order the prawn basil soup with lush sweet shrimp in an herby emerald green broth made hefty with lemony potato pearls. Pastry chef Keara Wilson is one of Ocean at Main’s alluring assets, so save room for her dark, crumbly torte matched with a fat ribbon of piped cardamom-tinged ganache and nestled with mellow bourbon ice cream. NAPA ROSE is the resort gem you pay no admission fee to enter. Five-star chef Andrew Sutton rewrote the Disneyland Resort’s dining from day one with this wine country open kitchen. I like to think his leadership of the signature restaurants inspired Disney to upgrade eats throughout the resort. 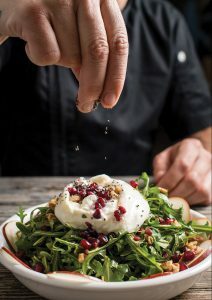 Irvine’s dapper new Northern Italian steakhouse (circa October) has a faint aura of nostalgia, with its ocean of bright white tablecloths, roomy seating, and high-polish attention from neatly uniformed servers and staff. This joint recalls those swanky expense-account palaces power diners flocked to when folks still drank booze with lunch and always at dinner—a great bread basket to start, sizzling steaks and huge chops, bulging lobster tails from Maine, and, of course, fine wines poured into glass decanters. The first Davio’s west of Atlanta, this snazzy venue constructed on the footprint of long-closed Prego is the youngest of 10 locations, all owned by celebrated operator and legendary host Steve DiFillippo. A massive menu of classic and more trendy dishes is a whatever-keeps-them-happy tome. “No” never seems to be the reply here, an attitude that almost seems quaint these days. But that’s not to say Davio’s is throwback heaven; plenty here is pure 2019, such as the five fusion spring rolls that mimic the packages DiFillippo distributes nationwide (buy yours at Costco). Or dedicated gluten-free menus, online ordering for takeout, or “grab and go” salads, paninis, and even breakfast goodies. SELANNE STEAK TAVERN has handsome good looks, a celebrity owner, and an all-in approach to sourcing and serving first-class steaks to a Laguna Beach crowd that expects the best. Rightfully proud of its Lord Stanley Cut of 38-ounce wagyu steak, plus there’s always that baller bar burger.